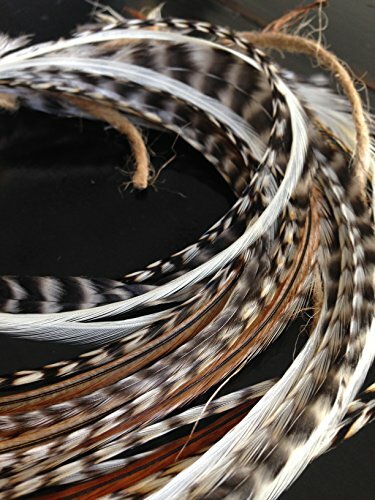 Beautiful hair feathers have been seen on many celebrities including Jennifer Love Hewitt, Miley Cyrus and many more. Feathers we sell are made by 'Exotic Feathers' all of their feathers uniquely dyed by an artisan, beautifully assorted collections. Truly one of a kind. All our feathers are 100% natural and genuine. Rare and unique grizzly solid rooster feathers. Feather Hair Extensions can be crimped into the hair with a bead (see installation instructions) then washed, curled, straightened, blow dried etc; they can be treated like your own hair. If you have any questions about this product by Exotic Feathers, contact us by completing and submitting the form below. If you are looking for a specif part number, please include it with your message.